When World War II ended, the large numbers of women who had taken industrial jobs during the war were forced out. Employers sought not only to give their jobs to returning veterans, but also to reassert the division of labor that had operated before wartime mobilization. 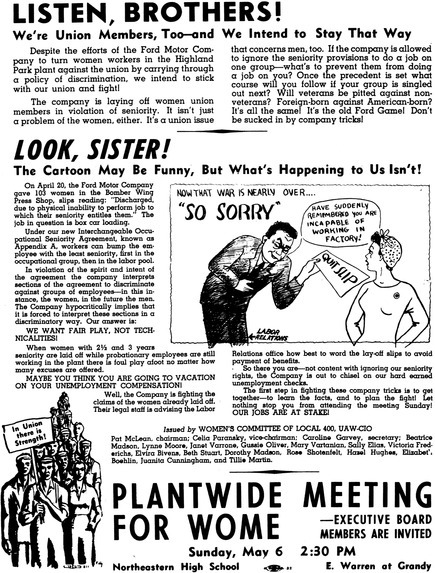 While women workers staged few organized protests, the Women's Committee of Local 400 of the United Auto Workers union created this leaflet urging both male and female workers to attend a mass meeting to fight against postwar layoffs at a Ford Motor Company plant in Highland Park, Michigan. Source | Women's Committee of UAW Local 400, "Listen, Brothers!," flyer, (Highland Park, Michigan, 6 May 1945), from the collection of Walter P. Reuther Library, Wayne State University. Rights | Used by permission of the Walter P. Reuther Library, Wayne State University. Cite This document | Women's Committee of UAW Local 400, “Female Union Members Challenge Post-War Job Discrimination,” HERB: Resources for Teachers, accessed April 23, 2019, https://herb.ashp.cuny.edu/items/show/1157.